Uploading your documents is very easy, everything can be done within the app. You just have to download the DriveNow app, open it and follow the steps. It takes only 2 minutes. Which documents do you need to upload? Your ID/ passport: Upload a picture of the front and the back of your ID card. This way we can be sure that it’s really you and not another person abusing your identity. Driving license: Upload a picture of the front and the back of your driving license. Make sure that your name, the validation date, the number of the driving license and the type of license (type B) are all visible and readable. This way, we can make sure that you really own your driving license for at least 2 years. Selfie: Take a selfie while holding your driver’s licence with picture facing the camera via the DriveNow app to let us know that it’s really you that is doing the registration. The selfie will be compared with the picture on your documents. Credit card: Take a picture of the front of your credit card. Don’t worry, the number of your credit card will automatically be hidden by our system and will not be visible for us. We only request a picture of your credit card to make sure that the name on it is the same than on your ID card. This way we can insure that nobody is using a stolen credit card. No credit card? It is also possible to register with the credit card of somebody else, for example, a family member of a friend. 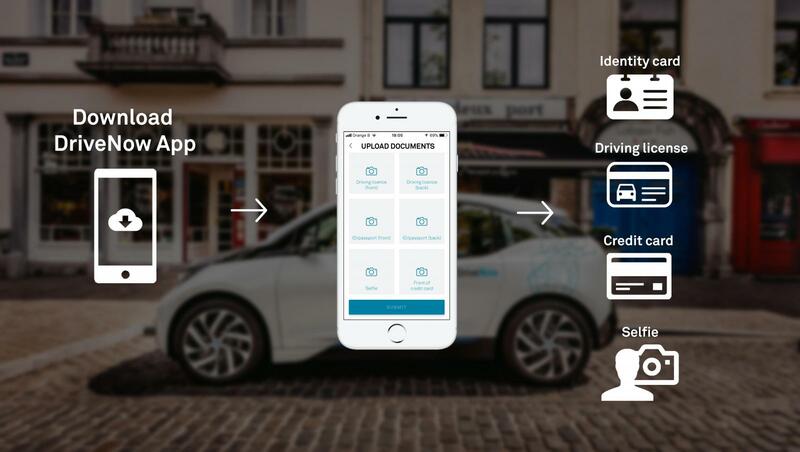 To do so, you need to present yourself at the DriveNow office together with the credit card holder. Here you can find more information about how to register with somebody else’s credit card.